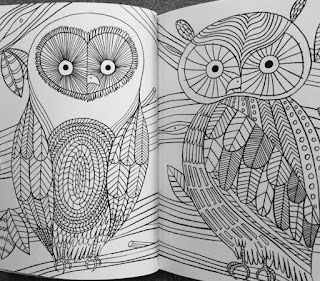 As many of you know I recently took up the hobby of adult coloring books. I've found that it's calming and brings down my stress level. I have a tiered container full of gel pens, markers and colored pencils that have been used upon many coloring pages. My sister and mother are just as addicted. 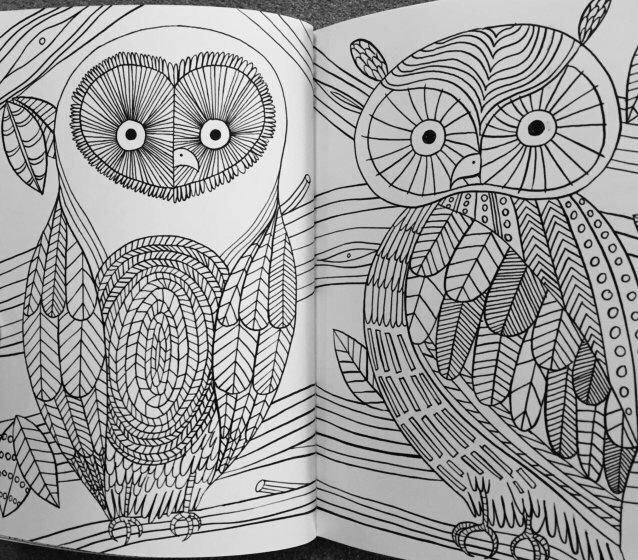 We are not alone in this; adult coloring books have become quite the rage. I've been coloring in The Mindfulness Coloring Book - Volume Two, with pictures drawn by Emma Farraron. It's the second book in a series. The format of the book is smaller than most coloring books. I liken it to the size of a hardcover reading book. Because of its size, I usually put this particular book in my purse and color in it while waiting at appointments. There are a total of 70 pictures to color in this detailed book. Some picture themes include owls, flowers, geometrics, abstract, and even fruits. The illustrated drawings are well-done and the pictures look beautiful after I'm done coloring. The pictures are printed on both pages of the book, and the paper has a nice thickness. I do wish the pages were perforated so I could easily tear them out but, other than that, this is a high-quality coloring book. 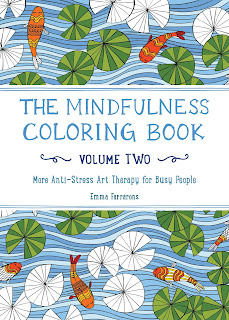 One person will win The Mindfulness Coloring Book - Volume Two. I like to use colored pencils mostly. I prefer a fresh box of crayons! But with these new adult books with such detail, I think gel pens would be great. I like to use colored pencils. I always color with colored pencils! I love the range of colors and the ability to color light or dark depending on the pressure. I really do not know. I would have to say colored pencils, but it has be soooo many years since I colored anything. Leave a comment on this blog post what you most like to color with (i.e. markers, colored pencils, gel pens). I like coloring with colored pencils, haven't tried gel pens yet! colored pencils or sharpies . thank you! I love to use my gel pens! I like to colour with markers. I tend to prefer colored pencils when coloring in these type books. I like to use colored pencils. I have a big set of Prisma Colors that I got in college. I would love to use colored pencils. I like to color with colored pencils, markers or Crayons. I would definitely be using colored pencils. I most like to color with crayons. I haven't tried glitter pens though, that could be fun. I like using colored pencils. Markers and gel pens are my favorites. I like to color the Adult coloring books with Colored Pencils! i like to color with crayons. I like to use fine tip markers. I like to use markers. I like to use a mix of things. I like to color with crayons mostly. I also use colored pencils and markers. I like to use colored pencils and fine markers. I like to color with color pencils. I would like to color with colored pencils. My daughter has a cute travel set that would be great to use. I like using gel pens and colored pencils - it gives me more control. Happy holidays! I like to color with colored pencils and use many colors! I most like to color with markers. I like to use nice sharp colored pencils. I've always used colored pencils when coloring. The tip was easier for me to stay in the lines.